I've been really inspired by two of my favourite bloggers latest posts-the lovely Make Do Style posted here about 'Thought of the Week-Clothing Allowance or Budget' and the gorgeous Wendy B posted a link to her fab post about 'Why Does Buyers Guilt Focus on Fashion'. They were both such interesting reads and although I don't really budget as such, I've finally learnt my Wardrobe Philosophy, which is to buy quality items that are either wardrobe basics or have the 'Wow factor'. The reason I don't have a clothing budget is that I generally do 95% of my shopping in the Charity shops or Boot sales and as I am so selective in my purchases, its usual for me to spend from £1 to £5 on an item and its rare that one piece will be £10 to £20. I'm always looking in my very local charity shop, if not once a day on the way to or from work, then every other day. 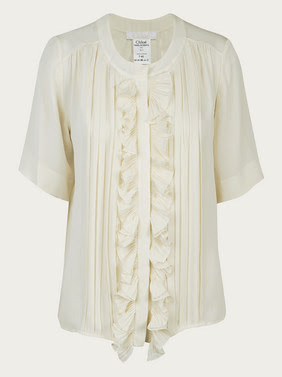 The first picture is a gorgeous Chloe blouse from Matches Fashion for £701. Its lovely, but I certainly couldn't spend that sort of money-even if I could afford to-on a blouse. So you can imagine how please I was to snap up this lovely one earlier this week from my local Sue Ryder Care for only £4.95!! Pricewise, its on par with a new blouse from Primark, but I know which I would rather!! Its the perfect summer blouse-I'll team it with jeans most probably and its certainly an investment piece in my wardrobe. 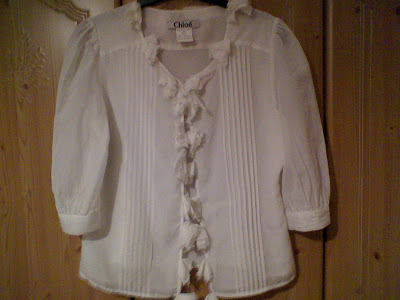 Its a typical Chloe style, with the ruffles and pintucking, a quintessential summer blouse that is timeless in style. I culled some of my wardrobe last week and next to wardrobe basics, have these plus items which to me have the 'wow factor'. To me quality beats quantity every time. Funnily enough, I don't have a 'Signature Style' but I tend to buy what I like-preferably vintage pieces and designer if I can find it. Its good to open your wardrobe and have stylish timeless, good quality pieces that will work for you year after year and season after season. We are all guilty of buying on impulse or ending up with items that are on trend but just don't suit us-note to self, no more shiny snakeskin leggings, LOL! I've learnt that I can actually like pieces but appreciate that its not necessarily right for me. Having items in my wardrobe that are from the 50s, 60s, 70s, 80s, 90s and noughties give such a variation in style and moods and as long as you care properly for your items, even a small wardrobe can last years and pay dividends. There you go, thats my Wardrobe Philosophy, hope it inspires you too, in looking for quality over quantity wherever you shop-be it in the charity shops, boot sales, Ebay, T K Maxx, The Outnet or Net-A-Porter. Happy Shopping and don't forget 'Shop Your Own Wardrobe' before you step out the house or browse the 'net, you may well save yourself some money or re evaluate what you actually need or want!! the blouse is gorgeous, I´m attracted all the time to this kind of blouses, I think I´m addicted cause they look so romantic! "I don't have a 'Signature Style' but I tend to buy what I like-preferably vintage pieces and designer if I can find it." -- I like this about you. I appreciate an eclectic style. Why be trapped in one look. And of course I love that you're going for "wow." Why not, right? You only live once! Sharon I much prefer your blouse to Matches !! The blouse is such a great find-definitely timeless. I'm such a huge fan of Chloe !!! It is a lovely blouse and you're right, it'll look perfect with jeans. Unbelievable what some people will spend on clothes. My problem too is that I'm a bit rough on clothes. I know that sounds well..strange. But going to school. Eating in a lunchroom. There is just so much I can spend on an outfit. Or should I say my parents will let me. What is worse these days is taxes are sky-high in so many place. Its unbelievable what's added on to a purchase. This piece you can dress up or dress down. Holy moly, Sharon, that blouse is an AMAZING score! OMG! No comment, my dear! only an OMG! Lucky U! AMAZING! Lovely blouse... it is so romantic. I also prefer quality over quantity and I don't follow fashion. I stick with what looks good on me. I completely agree with your philosophy. It's a shame when you get swept up in trends and must-have items, but I think often people just forget what's actually in their wardrobe already and what they might actually end up wearing or not. Love that blouse! Definitely a winner compared to the Chloe one. You can almost get a designer coat for that price (in fact, I'm pretty sure a brand new Burberry trench costs less than that). Hi there- I really appreciate all your comments on this post, some really great advice on wardrobe basics (thanks one of 365!) and so pleased you like my find too-thanks so much to all of you!! Another great find! Really interesting post, I think when you thrift/vintage/secondhand you always find the best and unique pieces. Have a wonderful weekend!! I love your blouse! it's amazing!! how lucky you are, such a great finds..
No way. That's a great blouse. I wonder if anyone will ever realise how low they price these clothes! Such a brilliant find! Fantastic post and what a great find! I really miss the charity shops of the UK. Here we mostly have giant thrift stores filled with stuff from just the past few years. It doesn't feel quite as much like a treasure hunt. kisses and I wish you a fab weekend! I thought of you last weekend when I went to my fave thrift shop and found original 50s dress in fabulous shape. The shopkeeper I spoke with said a very dear lady in her 80s donated them. You would have loved them. Sorry, but I didn't have my camera with me or I would have taken pictures. Love the blouse, ruffles seem to be in at the moment AND I adore your new winter coat. Just such a wonderful find and at a great price!! It's so pretty. And a Chloe blouse for only $5 wow! Hi everyone-thanks for leaving such lovely comments, I so much appreciate them all!! Hi ladies-thanks so much, so kind!! I must say that I agree with WendyB, I've been with many thoughts about this issue and it's the best philosophy. About your blouse, just lovely!! Thanks The Seeker, so kind!! Great look for less and for only 5 pounds too compared to £705 and it has the same look and feel. It always feels good to score a bargain and Sharon you sure know how to do it! Hi budget chic, so kind, thanks! !